This week is a bit of a weird one. when we review a pub that has already been done, we call it a Redo (Like when we went to the Royston , then back to the Royston). However If we revisit the same building but it has changed owners/names, we consider it a new review (Like when we went to Miss Libertine and then Captain Melville). But what are the rules when a pub retains its name, but rents out it's kitchen to a third party? The pub name is still the same, but the people behind the food have changed. As is the case with this week's review. 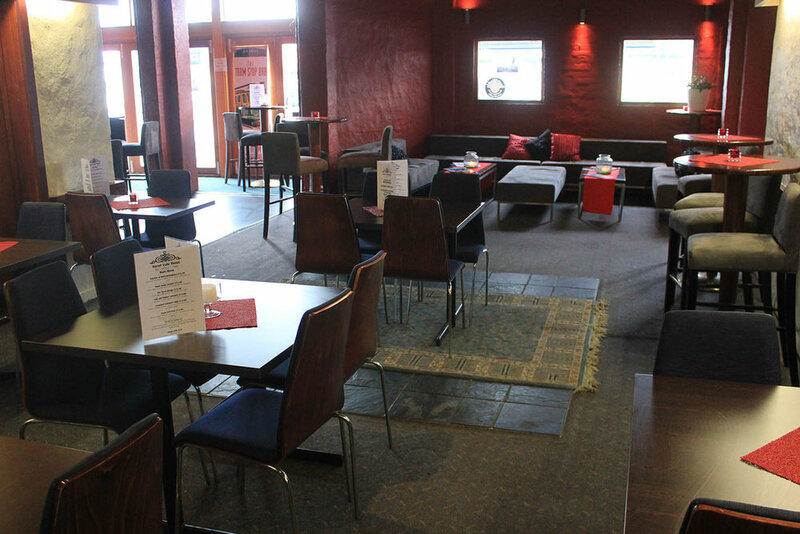 We visited the Ascot Vale Hotel back in 2013 (It didn't do very well) but now District 5 Bistro have moved into their kitchen and we had heard they were doing better. 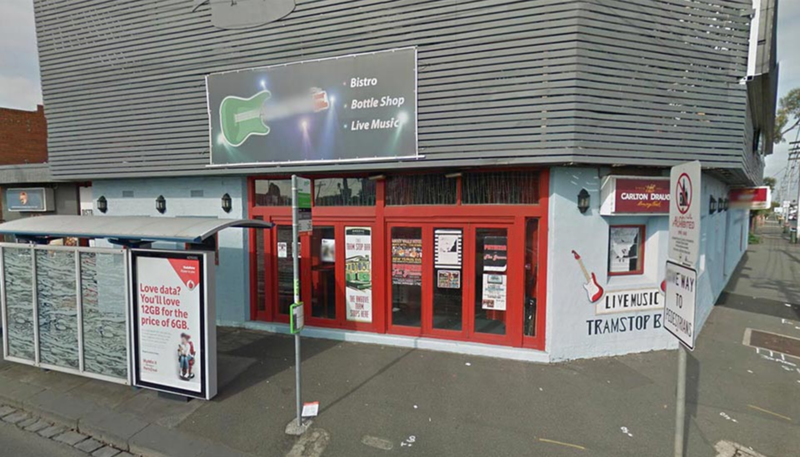 I think my ruling is to treat this as a new venue, but with echoes of a Redo (I'm still going to compare it to what we had in 2013). If you disagree feel free to leave a comment below and let me know. I really didn't enjoy our parma at the Ascot the first time we had it. Other than sporting a relatively thick chicken breast it had absolutely nothing going for it. I can still taste the dry, gritty, almost sandy bolognaise sauce that topped it all those years ago - So when I heard that District 5 had taken the helm I was all to eager to head back and see if they'd improved. As I mentioned in our first visit, the Ascot holds a special place in my heart as they bought the furniture from the Prince of Wales Hotel after they closed. 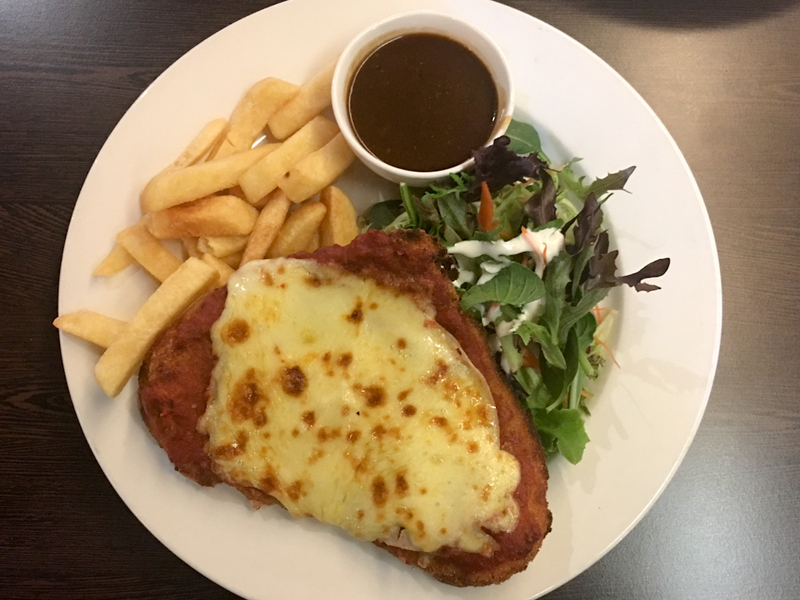 The tables and chairs on which the parmas at the Ascot sit once supported the greatest parma ever to exist, and a guess a piece of me hopes that some of that magic will bleed through into the food at the Ascot. Well nearly 5 years since our first review and the Prince of Wales furniture is still there. Looking a little worse for wear these days, but it was great to see that they're still kicking. The Ascot Vale Hotel is a bare bones pub. I want to call it a "dive bar" but in the most loving way possible. It's dark & dank, but it has a bit of charm. I was expecting to arrive to an empty pub at 6:30 on a Thursday evening, yet as we grabbed a table in the bistro the pub was filling up fast. Maybe it had gotten better? ... and ordered at the little podium in the kitchen. It's not often that you get a choice of steak sauce built into the cost of the parma, so that was a nice little touch from the get go. The tap list at the Ascot, like the pub, is pretty bare bones. Carlton, Guinness, Cascade Light and a cider are your options. I was surprised to see some love for Clifton Hill beers in the fridge, but if you're after a craft beer experience you're definitely in the wrong pub. The District 5 bistro uses a buzzer system that vibrates and lights up when your food is ready to be collected. Feelings on this system seems to be mixed, but I didn't mind taking the three steps from the table to the window to grab my parma. After we ordered, waiting for the buzzer to buzz, I noticed that almost everyone around us was tucking into a steak, not a parma. 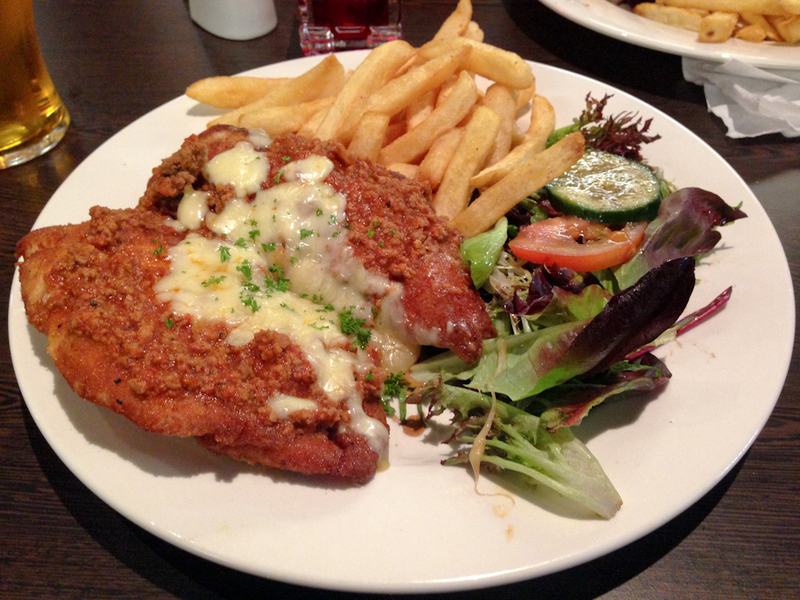 It would seem that parmas at District 5 are secondary to the big draw - their all day, every day $12 porterhouse special. I felt left out as the steaks actually looked quite good, and for only $12 that is one hell of a bargain. Well. Gone is the horrible bolognaise, so that's a good start. The schnitzel, however, has taken a definite dive in quality. Downgraded from 2 relatively thick chicken fillets to one Coles-Deli-Window factory made schnitzel. The crumbs were thick and the chicken was thin. It was cooked well, and not nearly as dry as its 2013 counterpart, but the parma at District 5 was definitely getting off to a rocky start. Unlike the toppings on the 2013 parma that were actively unpleasant, the toppings on District 5's parma were simply okay. Plenty of napoli sauce and cheese, good coverage and well grilled - But like the schnitzel it was all prefab, either from a can or a bag. There was ham included, but I had to check three times to see if it was actually there, it didn't add anything to the flavour parma at all. I mentioned earlier that we got to pick a flavour of steak sauce when we ordered our parma - The steak sauce was probably the best part of our meal. What would have been boring, unseasoned chips were rocketed back to life by a rich, thick gravy (peppercorn sauce, in this case). My only regret is that the serving of chips wasn't bigger, as the chip and sauce combo was my favourite part of the meal. The salad tried, but in the end missed the mark. It was big enough, there were some ingredients in it other than lettuce (not many), and it was topped with a rich, creamy dressing - but the leaves themselves were dry as could be and quite wilted. Overall not a very pleasant experience. As the general vibe of the quotes above tends to mirror - This was a cheap parma for a cheap price. You won't walk away hungry, but at the same time I would have rather chucked in an extra $5 for some quality ingredients. Seeing as the peppercorn sauce was pretty much our favourite part of the dish, I really want to head back to District 5 and try their $12 steaks. I feel that if this website was titled SteakDaze and not ParmaDaze our review of District 5 would have fared much better, as the $12 steak special seems to be where its at. I didn't actively dislike the parma at District 5, which is a definite improvement on our last visit - But there is still mammoth room for improvement, and I don't think I'll be hurrying back for a parma any time soon.